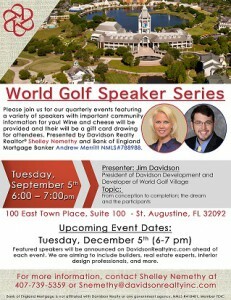 Join us at Davidson Realty’s headquarters in World Golf Village on Tuesday, September 5, at 6 p.m. when Jim Davidson will take attendees through the journey of World Golf Village from concept to completion. 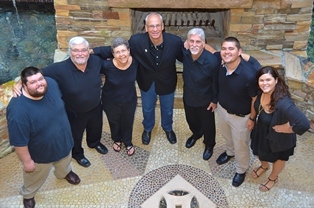 Jim, who is President of Davidson Development, was the driving force behind the community’s strategy, establishment and growth. Davidson Realtor Shelley Nemethy and Bank of England Mortgage Banker Andrew Merritt are sponsoring the free event, which is part of Davidson’s quarterly series featuring real estate related information. The greater World Golf Village area is buzzing with residential growth including more than 33,000 new homes in the works, which has been attracting interest from many businesses looking to serve the residents of our area. 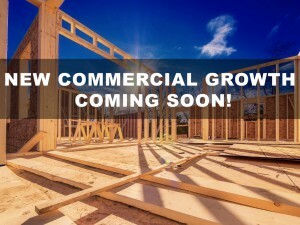 Davidson Realty has kept a close eye on the coming commerce to help buyers who are looking for conveniences like stores and restaurants. World Golf Village Developers, Davidson Development, Celebrate 25 Years! Davidson Development is celebrating its’ 25th year as one of the First Coast’ premier development companies. The company was launched in May 1989 by Jim Davidson and Ed Gil after they purchased the development rights to World Golf Village from a partnership group formed in 1987. An authority in the selection, planning, permitting, construction and marketing of long term, large scale mixed use real estate projects, Davidson Development has cultivated a reputation for smart real estate investments that continually yield high returns for investors.